A number of familiar favorites fill the sizable lunch and dinner menu, such as hot and cold mezze, flat breads cooked in a stone oven, salads, and grilled kebabs. Guests can opt for entrees over grazing, including seared Skuna Bay salmon with chickpeas and garlicky yoghurt, or braised lamb shanks. Members of the Aslanturk family, who?re behind the restaurant, plan to recreate lesser-known dishes from their homeland, such as ankara tava, a comforting pilaf dish with beef, tomatoes, and peppers. 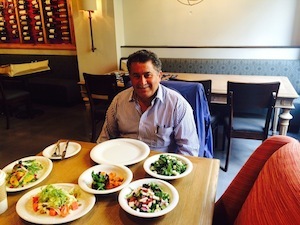 Ejder Aslanturk (pictured) is among the family owners behind Aknara, a Turkish restaurant coming to Dupont. Photograph courtesy of Ankara. The 120-seat space takes on a rustic Old World look, and includes a patio of near-equal size for 115 guests. An outdoor happy hour is planned with discounts on food and drinks, as well as al fresco brunch. The weekend prix-fixe menu ($35 per person) is modeled after a traditional Turkish breakfast, with small salads, fresh breads, jams, and honey followed by a choice of entree?think fried eggs in Turkish tomato sauce?plus complimentary coffee, tea, and a mimosa. ? la carte options will also be available.